Above photo, circa 1910, kindly supplied by Lisa Hudson, showing Hawksbury Street view from Elizabeth Street. Showing the Holy Trinity Church on the right and the "Railway Inn" on the left. Well established by 1868 and opening at 5 a.m. from 1900. From 1895, its size increased following a merger with its neighbour, the "Princess Maud". Part of this site must have been needed when the viaduct was built because the Council owned some of the ground in 1914. From the Dover Express and East Kent Intelligencer, 17 September, 1869. Price 1d. In the case of the "Railway Inn," Hawkesbury Street, permission to sell was granted to Mr. Marchall. From the Dover Express and East Kent Intelligencer, 14 April, 1870. Price 1d. Mr. Lewis applied that the transfer of the "Railway Inn," Hawkesbury Street, might be made to Alfred Barker. Mr. Barker, it appeared, had lived for nine years in Sandgate, where he had kept a public-house known as the "British Flag." No complaint had been made of any kind against him during that period and Mr. Lewis now presented a testimonial signed by a number of tradesmen resident in Sandgate, speaking to the respectability of the applicant. The case, it appeared, had been adjourned in order that an enquiry might be made by the Superintendent of Police; and it turned out from a letter that was now read, that the license of the "British Flag" had been refused by the Magistrates of Hythe in consequence of prostitutes having been kept in the house. Mr. Lewis said that the license was not refused to Mr. Barker in consequence of any special circumstances of the kind mentioned; but because the Magistrates of Hythe resolved to suspend the whole of the beer-house licenses at Sandgate. The Magistrates said the Bench could only act upon the information they had received. Mr. Lewis said the fact was as he had stated it, Mr. Barker having received notice that his license was suspended without any reason whatever being assigned. The Magistrates' Clerk said that it was necessary that a reason should be assigned, if a beer-house license was refused; and he could not assume that the Magistrates at Hythe did not know their duty. Mr. Fox said that he had been instructed by the Licensed Victualler's Society to oppose this application; and his case was precisely what had transpired before the Bench. The Society was desirous that the public-houses of Dover should be well-conducted, and they thought the suspicion of a license under the circumstances stated was a sufficient reason why the licensee's application to take another house should be opposed. After a consultation by the Bench, the Magistrates had instructed him to write to the Clerk to the Justices at Hythe, to enquire the circumstances under which the license of the "British Flag" had been refused; and pending his answer the case would be adjourned. Mr. Lewis then asked that the same course might be taken as was adopted on the 21st of last month when his friend Mr. Fox appeared in support of an application for the transfer of a license, into the Bench, having ordered that enquiries with the antecedents of the applicant should be made, gave permission to sell in the interim. The Magistrates' Clerk said that he should get a reply from the Magistrate's Clerk at Hythe in a day or two, and the adjournment need not therefore extend over Thursday. From the Dover Express and East Kent Intelligencer, 28 April, 1870. Price 1d. An application was made for the transfer of the "Railway Inn" to Mr. Thomas Roche; but it transpired that Mr. Roche already held the license of the "Lion." In reply to the Magistrates, Mr. Roche said he was looking out for a tenant for the "Lion," and only intended to retain the license of that house temporarily. The Magistrates denied to accede to the application; for, although there were no objections to the applicant personally, the Bench could not sanction the holding of two licenses by one individual. From the Dover Express and East Kent Intelligencer, 8 September, 1871. Price 1d. In the case of Mr. Edwin Clark, who applied for a renewal of the license of the “Railway Inn,” he was reminded that, during the past year, there had been one conviction against him for breach of license, and that, in another case, he had effected a compromise by paying something to one of the local charities. This was equivalent to a second conviction, though the Magistrates did not want to put it down in those terms, as, if they did, he must lose his license, it being their intention to renew no licenses in future where the holder had been twice convicted of a breach of its covenants. The applicant would see, therefore, that he had had a narrow escape, and the Magistrates hoped that he would take advantage of it, by keeping a more careful guard upon himself in future. From the Dover Express and East Kent Intelligencer, 7 October, 1870. Price 1d. 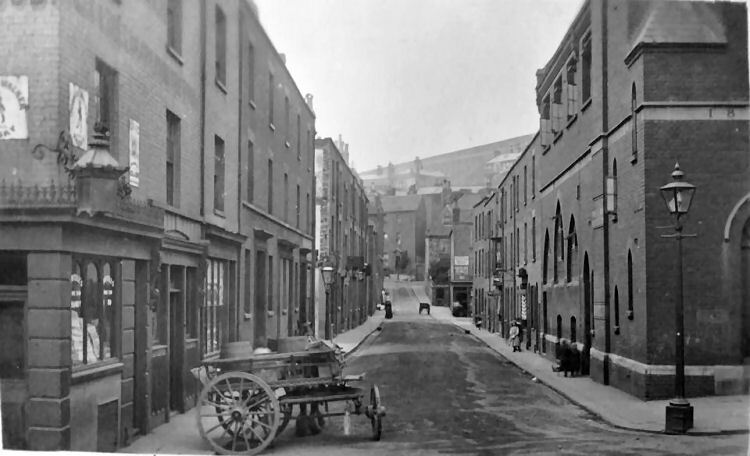 Edwin Clark, landlord of the "Railway Inn," Hawkesbury Street, was fined £1 and costs, for having his house open during prohibited hours. From the Dover Express and East Kent News, Friday, 27 March, 1874. Price 1d. Edwin Clark, of the “Railway Inn,” Hawkesbury Street, was charged with having men in his house on Sunday morning contrary to the Licensing Act and Thomas Plant, J. Hersey, H. Clark, and H. Jarvis were charged with being on the said premises. The men admitted being there, but the landlord pleaded not guilty. Sergeant Raymond said: last Sunday about eleven o'clock I saw three men go into the “Railway Inn.” I went to the door which was locked. I knocked at the door and heard some shuffling. After the noise had ceased the door was opened by the landlord. I asked where those were, and he replied, “What men? There are none here.” I said I saw them go in, and he said there were no one in the house. I asked him to go to the back-door and let a Constable in. I went to the back and saw Jarvis and Plant in the back premises. I took their names and the landlord said he did not know they were there. In a small back bedroom I saw Clark and Hersey. The one was undressed in bed. They were the same men that is aw go in. The landlord said they had no business there. The men at first said they were lodgers, but afterwards said they had done wrong. On another occasion I saw men go in and out of this house during prohibited hours. Constable H. Suter said he was with Raymond on Sunday and saw four men go into this house and he otherwise corroborated the last witness. Mr. Clark said he had had the door open for Sanitary purposes. He did not know that the men had come in. His wife was ill. The bench had no doubt but that the law had been broken. The men would be fined 1s. each and costs, making it 9s. 6d. each, and the landlord would be fined including costs £1 10s. 6d., the license would not be endorsed. From the Dover Express and East Kent News, Friday, 6 September, 1874. Price 1d. Edwin Clark, the landlord, who had been convicted of keeping his house open during prohibited hours on Sunday, the 22nd of March, was cautioned to be more careful. James Kennedy and Arthur Probyn, privates belonging to the 6th Regiment, were brought up charged with stealing a decanter containing whisky and also the contents of another decanter, from the “Railway Inn,” Beach Street, the property of Edward Clarke. Harriett Clark said: I am the daughter of Edward Clarke, who keeps the “Railway Inn.” On Friday evening last the prisoners came into the bar and called for drink. The whisky was in two decanters, which were within reach from the outside of the bar counter. I went into the back room and on my return I saw that one of the decanters was empty and the other decanter gone, whisky and all. The value of the whole is 12s. Fanny Wood said: I was in the “Railway Inn” on the night in question, when I saw the prisoners there. Whilst the last witness was serving some ale. Probyn took a decanter of whisky from off the sideboard and handed it to the other prisoner who poured the contents into a quart jug. He drank some and then asked me to drink, but I refused. I told them I should go and inform against them, and Kennedy then threatened me. He then went out and I then told the last witness what had occurred. After they had emptied the decanter they put it back in its place. I threatened to go for a Policeman, and Probyn would not let me go for about five minutes. Lance-corporal Leaton said: The prisoners belong to our Regiment. I was in the “Railway Inn” on Friday evening last between 9 and 10, when I saw the two prisoners there. Miss Clarke went out of the bar when I saw Kennedy take the decanter from the sideboard and hand it to Probyn, who poured the contents of the decanter into the jug I was drinking from. As soon as I saw what he had done, I asked him who gave it to him and he said the landlady. I then asked the landlady if she had given any whisky to the prisoner and she said “No.” I saw Kennedy put the decanter back. I noticed there was another decanter, but I did not notice the going of that. I went out and when I returned Kennedy was standing by the door as if to stop anyone from coming in. By the prisoner: I could not say whether it was a pot or a pewter. We had glasses. The officer in attendance gave the prisoners a good character. The prisoners pleaded “Guilty” to the charge, and the bench sentenced them to a month's imprisonment with hard labour, remarking that a heavier sentence would have been inflicted if their officer had not given them a good character. From the Dover Express and East Kent Intelligencer, 21 February, 1902. Price 1d. Emma Angel was charged with being drunk, disorderly, and using obscene language in Hawkesbury Street. Police Constable Kingsmill said the previous day at 10.45 p.m. prisoner was ejected from a public-house in Hawkesbury Street. She would not go away, but tried to re-enter the house, using filthy language. William Clarke, landlord of the “Railway Inn,” Hawksbury Street, gave evidence as to prisoner coming into the house and making a disturbance and being ejected from the house by two different constables. He also produced a purse containing 24/6, which prisoner left in his house. From the Dover Express and East Kent Intelligencer, 21 September, 1906. Price 1d. The license of the "Railway Inn," Hawksbury Street, was transferred from Mr. J. R. Willson to Mr. R. W. Hayman, who formerly kept the "Crispin Inn," Sandwich. It was stated that the new tenant had been fined at Sandwich for selling adulterated whisky. The applicant stated that this was actually done by a barmaid, who, in his absence, had added water to replace whisky she had wasted. From the Dover Express and East Kent News, Friday, 18 July, 1913. Price 1d. The death occurred at the “Railway Inn,” Dover, after an illness of three days from pneumonia, of Mr. William Henry Rogers, a licensed victualler for thirty-six years, many of which were spent in Dover. Mr. Rodgers who was 56 years of age, had previously held the licenses of the “Mogul,” the “King Edward VII,” the “Globe,” and the “Plough. The lease, from April 1914, was for 35 years. After the East Kent Brewery Company went into voluntary liquidation it was transferred to Jude, Hanbury and Company who shared the property with Mackeson at the close. Eleven other licensed premises stood within 185 yards of this pub and it received the thumbs down in 1932, closing on 31 December that year. From the Dover Express, Friday 14 October 1932. At the Principal Meeting of the East Kent Compensation Authority, at the Sessions House, Canterbury, on Tuesday, Mr. G. K. Anderson being in the chair, the magistrates refused renewal of the licences of two houses, and they were referred for compensation. They were, the "Railway Inn," Hawkesbury Street, registered owners, Dover Town Council, leaseholders, Messrs. Jude Hanbury and Co., licensee, Albert John Stanley Pettit. The "Granville," Dover Street, Folkestone, owners, Messrs. Jude Hanbury and Co. licensee, Harry Kennard. Mr. C. Hebden Phillips was appointed as valuer. Although used as a private dwelling from then, the brewer still seemed to have an interest in 1936 when they offered the lease to Dover Corporation. On the other hand, and being honest if nothing else, I must reveal that I read in 1954 that 7, 8 and 9 Hawkesbury Street, including the "Railway Tavern" were purchased by the Corporation before world war one and had since been used as a dwelling house and latterly as a store or garage. With so many "Railway" prefixes being found, I suggest you also look at the "East Kent Railway Tavern" and the "Railway Bell".